FM Ronald Simpson of the Black Bear legend was spotted on youtube.com playing 12-year old prodigy Ray Robson at the U.S. Masters in Hendersonville, Tennessee. Simpson had bolted out of the gate with a 4-0 score before facing Robson. While he struggled in the later part of the tournament, it was inspiring to see the veteran in action and hopefully, we will see more of him in future events. Simpson was a contemporary and good friend of Maurice Ashley in Brooklyn's "Black Bear School of Chess," and is known for his wild, attacking play. He played in the historic Wilbert Paige Memorial tournament which featured ten of the top Black masters in the world. That tournament received international attention and was played in Harlem, New York. Simpson is currently based in North Carolina. FM Ronald Simpson at Wilbert Paige Memorial in 2001. The U.S. Masters saw GM Jaan Ehlvest take first with an undefeated 7½-1½ followed by IM Bryan Smith, FM Kazim Gulamali and Faik Alekserov of Azerbaijan with 6½-2½. Robson finished with 6-3. 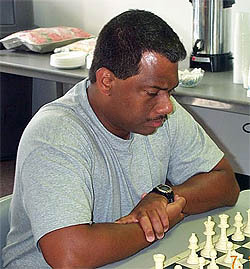 "Muhammad earns IM title," uschess.org, 21 March 2007. Note: Youtube.com caught the tail-end of Simpson- Robson here. Simpson is also shown analyzing Jeffrey Kidd's game. (Robson can be heard in the background.) Interesting!